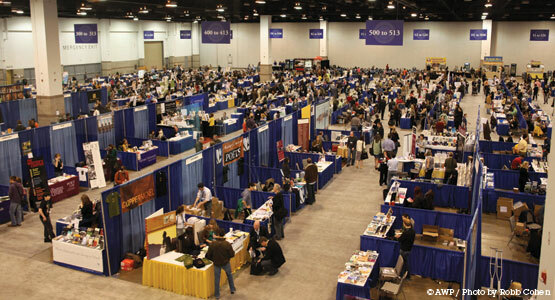 In a few weeks, thousands of writers and editors will flock to Seattle for the annual AWP conference, and for the first time, I’ll be among them. As a newcomer, I’m overwhelmed by the thought of more than 12,000 writers rubbing shoulders at a massive bookfair and cutting loose at a nightly dance party. (AWP veterans and bloggers have already warned me about the dizzying amount of stargazing, badge-scoping, and bright tights I’ll see.) In addition to emotionally readying myself for the apparent madness that is AWP, I’ve been making these preparations. I realize that it’s impossible to research everyone on every panel I’m attending. However, I am trying to do some preliminary research so that if someone asks me whose panel I’m seeing next or what I thought of Richard Nash’s discussion on small press readership, I’ll have something to say. I’m also trying to bulk up on Superstition Review material, as I’ll be manning our table at the bookfair for an hour each day. I’m sure we’ll be seeing a lot of past contributors there as well, and I’m hoping to be able to pick some out of the swarming crowd of writers. The S[R] team will be doing a lot of live reporting from the conference, which means learning the art of tweeting on-the-go. I’m not very Twitter savvy, but thankfully we have a few social-networking wizards representing the magazine this year – I hope to pick up a few things from them before the conference begins. We’ll be using an app called Everypost this year, which allows us to post content to all of our social networks at once. This will make live tweeting from panels and readings so much faster, though I’m sure we’ll still be seen occasionally hunched over our phones, trying to type a fantastic quote. We’re also hosting a few contests over social networks with daily prizes at stake, so be sure to stop by #TableC40. Of course, we’ll be on the lookout for #SRalum and continuing the ever-entertaining #overheardatAWP. I’ve heard about AWP’s classic $16 water bottles, so I’m not planning to buy much food onsite. At the same time, I don’t want to spend hours away from the conference in search of a decent restaurant or grocery store. Luckily, there’s a Trader Joe’s about a mile from the conference hotel and a host of good restaurants downtown. To save on time and money, I’m planning to stock up on snacks that I can break out in between sessions. I also know that I will need to escape the madness of the convention center at some point. Might as well leave to find food! Being in downtown Seattle, it will be really tempting to visit Pike Place Market. I could spend the entire afternoon at the market though, so if I venture there, I’ll have to do so with a purpose (i.e. Beecher’s cheese and Le Panier’s croissants). I am planning to spend some money at the bookfair – I know I won’t be able to resist buying a few books and signing up for the occasional subscription. And I want to. We are at AWP because we understand the love and devotion that goes into literary publishing and want to support each other’s craft. However, I am a poor, starving college student. Ok, maybe not quite starving, but I might be after I spend all my money on croissants and literary magazines in Seattle.